Maximize the size of TV screens with the easiest to fit binocular ever introduced - MaxTV glasses! 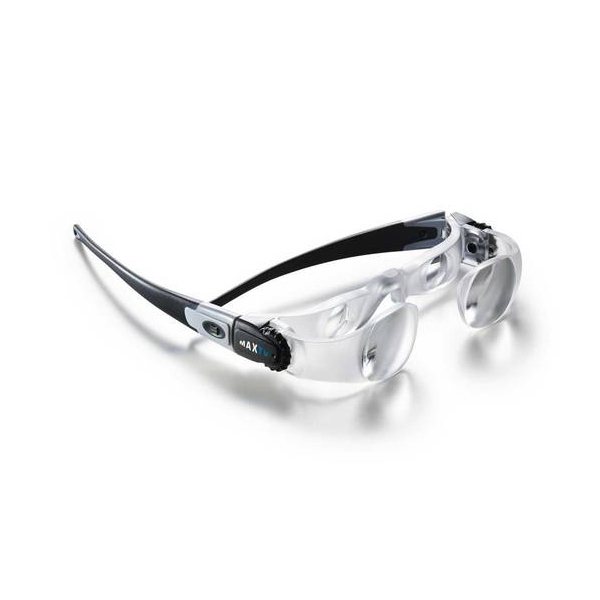 These hands-free, head-mounted glasses provide 2.1X magnification AND can be adjusted so that each eye lens can be focused separately. The glasses will focus on objects from distances of 10 feet to infinity and are perfect for watching TV, sporting events, movies, theater, bird watching, or any other distance viewing activity in which a magnified image would be helpful. With flexible temples, the MaxTV telescopic glasses are the most comfortable television viewing device ever. Don't rush out and spend thousands on a large screen TV - try the MaxTV first! * Diopter compensation: ±3.0 dpt, right/left can be separately adjusted, cylinder correction is not possible.